Celebrating Gardeners’ World at 50! This year, 2017, sees the celebration of 50 years of BBC2’s Gardeners’ World. As part of the celebrations a TV team will be filming on the opening day of BBC Gardeners’ World Live, at the NEC Birmingham, (15th – 18th June 2017) catching up with presenters past and present and taking in the show gardens and floral marquee. There will also be a special birthday cake created by Nadiya Hussain. 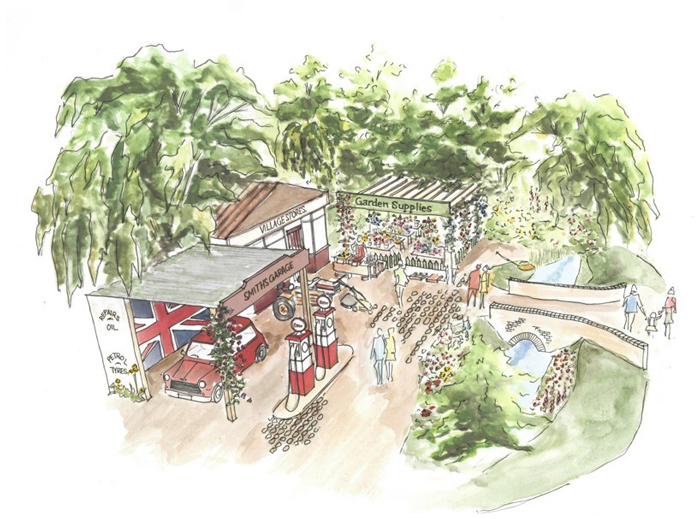 This special milestone is being celebrated at BBC Gardeners’ World Live with two feature gardens designed by Paul Stone who has designed ‘The Nostalgia Garden‘ and Professor David Stevens, who has designed the ‘Anniversary Garden‘. The Nostalgia Garden (illustrated below) takes us back to the swinging sixties, when the BBC launched Gardeners’ World. The rest is 50 years of amazing history. BBC Gardeners’ World Live 2017 will look back at how things were in the garden 50 years ago with a nostalgic scene from the 1960s. Paul has designed a garden that the public will be able to walk through, depicting a village scene typical of the period. The first Flymo mower was sold 50 years ago and one can be seen keeping the grass in check on a section of the riverbank! There will also be a garage, fuel pumps and a classic 1960s Mini Cooper. Visitors will be able to see the top ten plants of the decade and compare them to those of 2017. As Paul grew up in the 60s and started his gardening career in landscaping – going on to appear in the popular gardening programme himself – there is no doubt that this show garden will have special resonance for him. His Canal Boat Garden for BBC Gardeners’ World Live 2016, was a great success with show visitors and one feels sure that this nostalgic look at the 60s will be equally so. The Anniversary Garden: A Brief History of Modern Gardens, designed by Professor David Stevens with Peter Dowle, will pull together a fascinating vignette for each decade of gardening over the past 50 years. It is a period that has probably seen a greater change in gardens than ever before while TV, radio and the media have made an enormous influence on the way we garden and view gardening. I am really looking forward to seeing how each decade is depicted. The 60s, still a time of relative austerity with domestic garden design in its infancy and the 70s where hard landscaping was available at the burgeoning range of garden centres. On through to the 80s, when the ‘Outdoor Room’ came into its own and the 90s with a greater awareness of the environment and the flower meadow became popular. The 2000s when the ‘Room Outside’ started to be taken to new levels with new and elegant materials being readily available and planting styles embracing hardy perennials and grasses. Professor Stevens has a prestigious career with 26 RHS Chelsea medals, 11 of which have been Gold plus three Best in Shows. David opened the first ever BBC Gardeners’ World Live with Geoff Hamilton, 25 years ago, and so it is a welcome return home for him. Peter Dowle, contractor for the Anniversary Garden, is a Chelsea, Malvern and Hampton Court Gold winning landscape designer, based at Howle Hill Nursery. Celebrations will continue with a huge commemorative flower bed, planted at the show, with 75,000 ageratum and marigolds, a veritable feast for the eyes! This will be planted on a bank overlooking the outdoor area of the show. All images ©BBC Gardeners’ World Live.